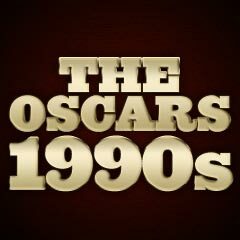 Note: Oscar® and Academy Awards® and Oscar® design mark are the trademarks and service marks and the Oscar© statuette the copyrighted property, of the Academy of Motion Picture Arts and Sciences. This site is neither endorsed by nor affiliated with the Academy of Motion Picture Arts and Sciences. The winner is listed first, in CAPITAL letters. TOM HANKS in "Philadelphia", Daniel Day-Lewis in "In the Name of the Father", Laurence Fishburne in "What's Love Got to Do With It", Anthony Hopkins in "The Remains of the Day", Liam Neeson in "Schindler's List"
HOLLY HUNTER in "The Piano", Angela Bassett in "What's Love Got to Do With It", Stockard Channing in "Six Degrees of Separation", Emma Thompson in "The Remains of the Day", Debra Winger in "Shadowlands"
TOMMY LEE JONES in "The Fugitive", Leonardo DiCaprio in "What's Eating Gilbert Grape", Ralph Fiennes in "Schindler's List", John Malkovich in "In the Line of Fire", Pete Postlethwaite in "In the Name of the Father"
ANNA PAQUIN in "The Piano", Holly Hunter in "The Firm", Rosie Perez in "Fearless", Winona Ryder in "The Age of Innocence", Emma Thompson in "In the Name of the Father"
STEVEN SPIELBERG for "Schindler's List", Robert Altman for "Short Cuts", Jane Campion for "The Piano", James Ivory for "The Remains of the Day", Jim Sheridan for "In the Name of the Father"
Spielberg won his first competitive Oscars for the powerful, documentary-style, 'historical' dramatization of Thomas Keneally's 1982 book (from a screenplay by Steven Zaillian) about the Third Reich's Holocaust, and the role of one complex man named Schindler (Liam Neeson) - a failed German industrialist and Catholic war profiteer (a pots-and-pans factory owner), who struggled to save more than a thousand Polish-Jewish lives in Nazi-occupied Poland with the assistance of Jewish accountant and confidante Itzhak Stern (Ben Kingsley). 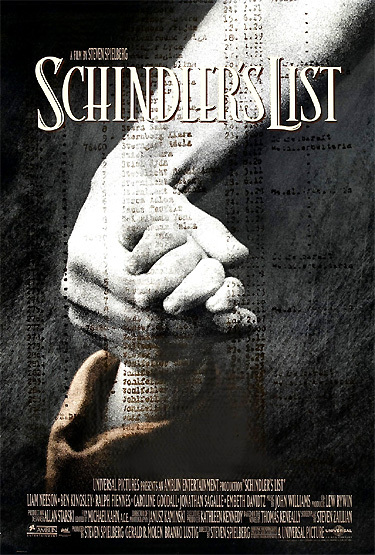 The three hour-long, small-budget ($23 million) film had twelve nominations and seven overall wins (Best Picture, Best Director, Best Screenplay, Best Art Direction, Best Cinematography for Janusz Kaminski, Best Film Editing, and Best Original Score - by John Williams). Surprisingly, the film won no acting awards. Spielberg also triumphed in the same year with three technical-achievement awards for his box-office hit Jurassic Park: Best Sound, Best Sound Effects Editing, and Best Visual Effects. Four of the five Best Picture nominees were serious-minded films. The one exception was the box-office hit and action thriller The Fugitive (with seven nominations and one win - Best Supporting Actor) - the story of the relentless tracking of a convicted innocent man in director Andrew Davis' re-make of the 60's long-running TV series - it was notable as the first - and only - Best Picture nominee remake to be based on a popular TV series. Jane Campion's nomination as Best Director for The Piano made her only the second woman in Oscar history to be nominated in the category. Campion is the first (and only) woman to have directed a Best Picture nominee AND to have received a Best Director nomination for herself. [The first woman ever nominated for Best Director was Lina Wertmuller for Seven Beauties (1976), seventeen years earlier.] Although Campion lost the Best Director Oscar, she won an Oscar for Best Original Screenplay. Half of all the male acting nominations went to British performers (Day-Lewis, Hopkins, Neeson, Postlethwaite, and Fiennes). All four of the year's acting winners were first-time Academy Award winners. The Best Supporting Actor Oscar was won by Tommy Lee Jones (with his second nomination and first Oscar win) for his performance as determined and relentless, laconic Deputy U.S. Marshal Samuel Gerard who tracks fugitive Harrison Ford in the exciting chase film The Fugitive. Many felt the award should have gone to Ralph Fiennes instead. Six-time Best Actress nominee (in 1949, 1953, 1956-1958, and 1960) and win-less Deborah Kerr received an Honorary award during the ceremonies, "in appreciation for a full career's worth of elegant and beautifully-crafted performances." She had appeared in some of cinema's greatest films, including Black Narcissus (1947), I See A Dark Stranger (1947), Edward, My Son (1949), The Prisoner of Zenda (1952), From Here to Eternity (1953), The King and I (1956), Tea and Sympathy (1956), Heaven Knows, Mr. Allison (1957), Separate Tables (1958), The Night of the Iguana (1964), and The Arrangement (1969). Brad Pitt was un-nominated for his performance as terrifying, homicidal serial killer Early Grayce in Kalifornia, nor was Val Kilmer as philosophical, ravaged Doc Holliday in Tombstone, nor was Ben Kingsley as Schindler's Jewish accountant in Schindler's List, nor was Debra Winger as Arliss Howard's wife Vida in a romantic triangle in the pyrokinetic, incendiary Wilder Napalm. Tim Burton's offbeat, stop-action animated musical The Nightmare Before Christmas was nominated (and lost) for only one award: Best Visual Effects, but was ignored for Danny Elfman's original musical score, and for the songs in its soundtrack (there were about a dozen songs in its 74 minutes). Unexpectedly, there were no nominations for Wayne Wang's mother-daughter stories (adapted from Amy Tan's novel) in The Joy Luck Club. Juliette Binoche was denied a nomination as grieving wife Julie Vignon de Courcy in the first film of director Krzysztof Kieslowski's three-color trilogy, Three Colors: Blue (Fr.) (aka Trois Couleurs: Bleu). Denzel Washington was denied an acting nomination for his performance as black, ambulance-chasing defense lawyer Joe Miller (opposite Best Actor-winning Tom Hanks) in Philadelphia, as was Jeff Bridges for his role as post-traumatic stress disorder victim Max Klein in Weir's Fearless, and Arnold Schwarzenegger as fictional action hero film character Sgt. Jack Slater (and himself) in Last Action Hero. Although nominated for Remains of the Day, Anthony Hopkins should also have been nominated for his role as Christian novelist C.S. Lewis in Shadowlands (a film mostly neglected by the Academy). And Matthew McConaughey was un-nominated for his memorable performance as the seasoned suitor named Wooderson of Texas high school girls in Dazed and Confused. An emerging romantic comedy masterpiece, Groundhog Day, struck out for Oscar nominations. There was no recognition for director/screenwriter Harold Ramis, or for actor Bill Murray's superb characterization as TV weatherman Phil who was forced to repeat the same day over and over again in an endless loop, and (supporting) actress Andie MacDowell as TV producer Rita (Phil's love interest). Composer John Williams' musical score for Jurassic Park was also not nominated.